While shear grab and mixer wagons are one of the most common ways of feeding livestock, the system does not suit every business. Richard Bradley takes a look at some alternative attachments to do the job. 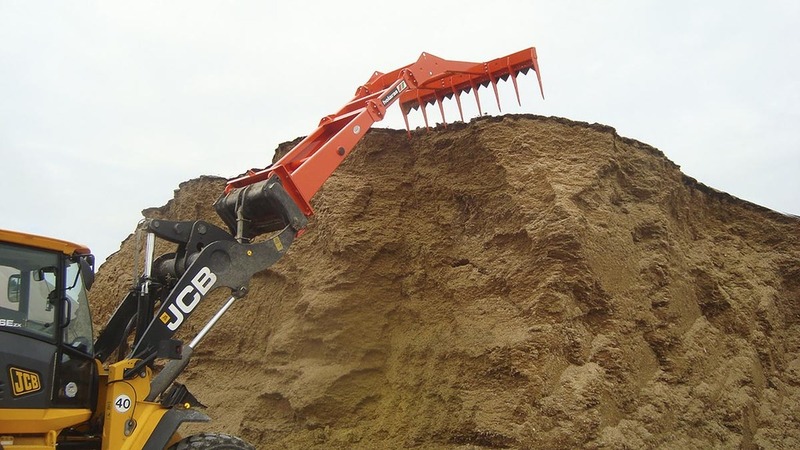 Along with its range of conventional shear grabs, Northern Irish manufacturer Redrock offers a range of shear buckets. Offering additional flexibility, an internal bucket is featured instead of a conventional grab’s tines. The firm says this eliminates the need to use a separate grab and bucket, as the grab can be used to pick up loose feeds and concentrates without spillages. Redrock also says the grab, which is available with an 85cm or 100cm opening, is suitable to pick up and split round bales. Five models are available across two ranges, with capacities ranging from 1.1cu.m-2.1cu.m. Complementing its range of diet feeders, Trioliet also offers a high capacity silage cutter. With a similar design to a shear bucket, the Triomaster uses a bucket base with a large closing grab, which features a high pivot point to allow the grab to open wide; maximum opening on the two models is 2.4-3.9m. Unlike a conventional shear grab, the firm says its Triomaster should only take shallow (45cm) cuts from the clamp. However, it says this should help to keep the clamp face fresher. Thanks to its bucket base and closing knife, Trioliet says the attachment can be used to handle loose materials and concentrates without spillages. The firm also offers the Triomaster with an on-board weighing system from Digi-Star, which should reduce unnecessary trips around the yard. Two models are available, with prices of £11,440 for the 2cu.m capacity S200, and £15,400 for the 3cu.m S300. 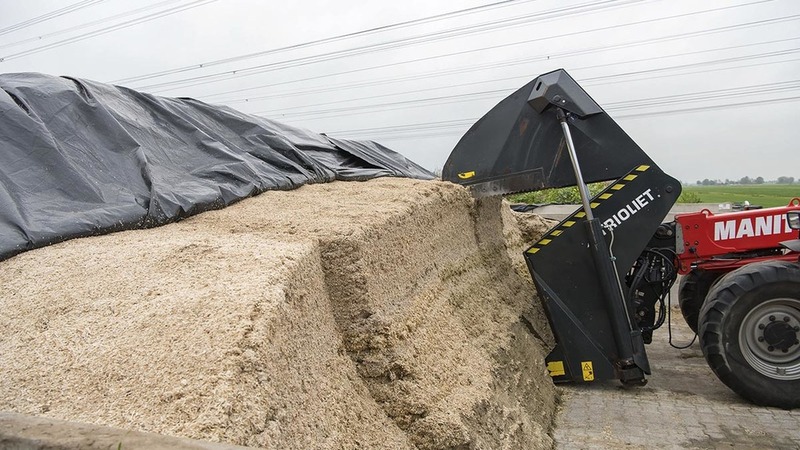 UK diet feeder manufacturer RS Agri now offers a rotary silage defacer, Silacut. Driven by two hydraulic motors, the defacer features a rotating drum with replaceable cutting knives to remove the forage from the clamp. The firm says its Silacut easily cuts away compacted grass silage, as well as maize and whole crop. 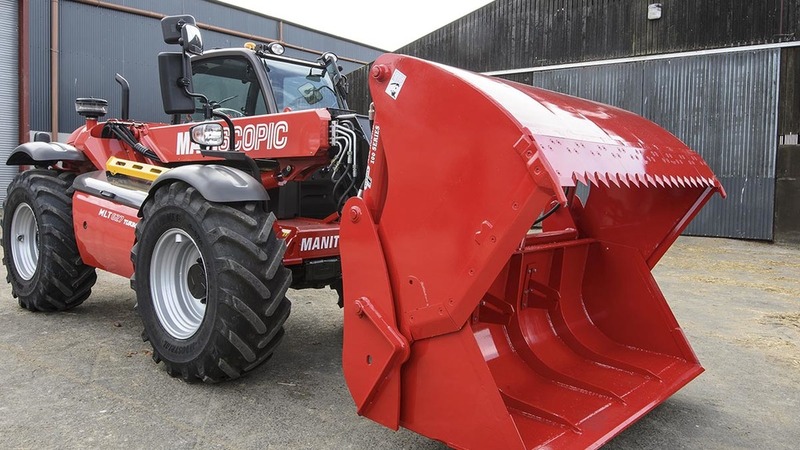 RS also says its Silacut reduces spoilage on the clamp face as it only takes a shallow cut, and, as forages are pre-chopped, mixing times and subsequently wear in a mixer should also be reduced. Two models are available; 2.5m-wide unit on a frame or a 2.3m-wide unit fixed to a 1.75cu.m bucket. Price for the standalone 2.5m-wide Silacut is £4,450 plus VAT, with the 2.3m-wide bucket mounted model costing £5,800 plus VAT. 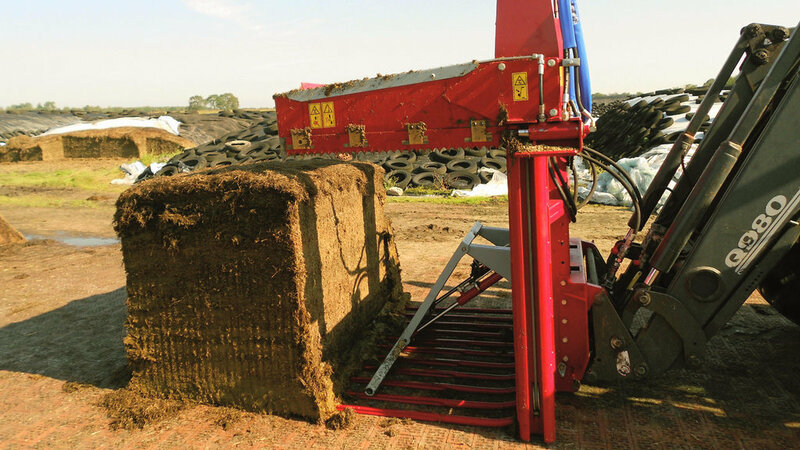 Dutch manufacturer Holaras, known for its range of silage clamping equipment, now offers a high speed way to pull silage away from the clamp. Holaras’ Tiger silage scraper features a bank of cutting knives and metal tines, to cut and pull away the clamp face, which is mounted on a long reach arm. 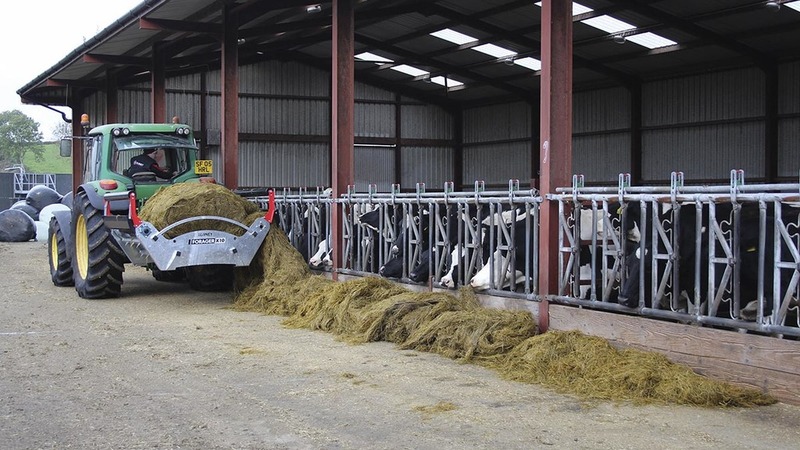 Available in 4m, 5m or 6m lengths, the arm allows fixed mast loaders to reach to the top of large clamps, reducing the chance of falling silage. The firm says its Tiger is designed to work with maize and whole crop silages, and not grass silage. While Holaras says it is possible to cut away grass silage with the Tiger, it says the clamp face can be left quite rough. Three working widths are available, with prices ranging from £4,260 for the smallest 1.8m wide, 4m reach machine, to £6,650 for a 3m wide, 6m reach machine. 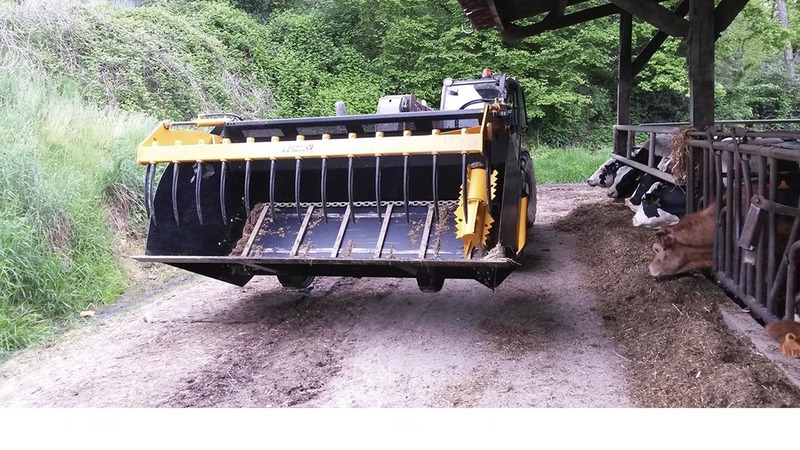 Offering a wide range of novel feeding and bedding attachments, French manufacturer Emily’s Disfib is an alternative take on a feeder bucket. Designed to better handle long- or un-chopped silage, the Disfib uses a chain and slat feed-out system, rather than a more conventional auger. A rotary agitator is fitted to mulch the crop to an extent and force feed out of the bucket. Options on the Disfib buckets, which are available in 1.9-3.7cu.m capacity, include a grab or rotary cutting head, allowing silage to be removed from the clamp face into the bucket. 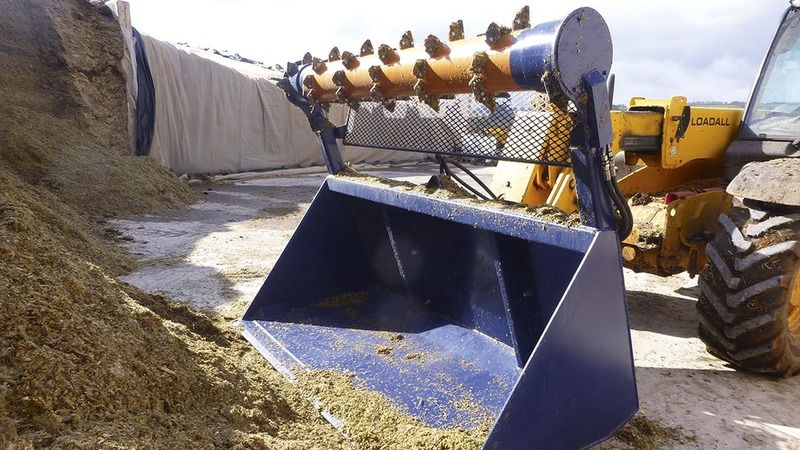 A separate concentrates compartment is also available as an option, which features a hydraulically driven auger to dispense minerals as silage exits the bucket. Retail price for a 2.4m wide, 2.5cu.m dispenser bucket with one discharge door and mineral dispenser is £11,000; silage grab costs an additional £1,560. Known for its range of diet feeders, family owned German manufacturer BVL offers a range of silage block cutters. Via the use of hydraulically powered reciprocating knives, the tractor or loader mounted machine cuts silage into large blocks. Thanks to its vertical mast and moving knives, the block cutter leaves a straight and clean cut on the clamp face, which should help reduce spoilage through secondary fermentation of the silage. BVL offers 10 different models of block cutters from three ranges; Topstar, Megastar and Master, with prices ranging from £8,380-£10,980. Topstar models, 1.65-2.95cu.m capacity, feature a 2m wide knife and are able to cut 0.8m into the clamp. Megastar models, which have the same size and volume as Topstar models, feature a more robust cutting system. The largest Master range, made up of two models with 2.5cu.m and 3.6cu.m capacity, feature a 2.05m wide knife, and can cut up to 1.05m into the clamp. All tractor mounted models feature a hydraulic lifting frame to allow cutting heights up to 2.8m and unloading into feeders. Northern Irish manufacturer Blaney offers two round bale unrollers. The firm’s unrollers feature a hydraulically driven bed to feed out round bales, which can be done to either side. Designed to allow one machine operation, loading it is taken care of by a set of removable bale spikes, which are mounted to the machine’s headstock. As standard, the frame is unlocked by a rope latch to prevent accidental removal; hydraulic locking is available as an option. While the firm’s X6 unroller is only available as a tractor mounted machine, the heavier duty X10 is also available as a loader mounted attachment, which allows feeding into troughs or over barriers. Also available as an option, the X10 can be fitted with a 0.6m or 1m side conveyor. Retail price for the X6 is £3,700, with the X10 costing £4,400. Bale handling equipment specialist, Tanco also offers a multi-purpose shear grab. The firm’s Multi Shear features the rear frame and bale net/wrap retainer from its Bale Shear and the knife from a conventional shear grab. 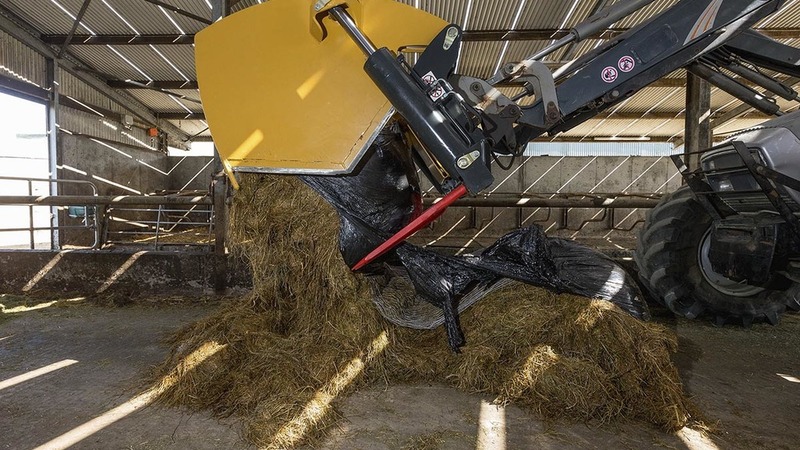 Tanco says this gives the attachment added versatility, as it can just as easily cut silage from a clamp leaving a clean face, as it can quickly split round bales, while retaining the net and wrap. Capable to split round bales 1.2-1.55m in diameter, the Multi Shear uses the same hydraulic line to operate the grab’s knife and the bale wrap retainer, which allows the operator to split bales into a feeder without first having to remove wrap. Price for the 2m wide Multi Shear is £3,700.